The processes occurring during plastic deformation in alyumin-silicic alloys. The formation of eutectic and primary is associated with the presence of silicon in the alloys of hydrogen and nitrogen. Fragility alloys Al–Si proposed as a form of hydrogen embrittlement. Hot plastic deformation is degassing alloys due to the joint application of temperature and pressure. Decontamination techniques developed, allowing to obtain a structure approaching the solid solution due to the application of cyclic pressure and temperature (hot forging and rolling). The prospects of creating a new generation of deformed alloys of Al–Si multi-purpose. Keywords:Hydrogen, degassing, deformation, alyuminsilicic alloys, mechanical properties, microstructure. Peculiarities of structural changes during heat treatment are considered. It is established, that atoms of iron take part in diffuse processes of quenching and aging, which influence on the amount, size and morphology of iron-based intermetallic phases. Keywords:Structure, diffusion, morphology, intermetallic phase, quenching, aging. In the article contains a synthesis of the results of research on the processesoccurring on the working surface of rolling-mill rolls. Are the main causes of the destruction of the working rolls surface during operation. Keywords:Forming rolls, failure types, operation, liquation, destruction, crazing net. Modern thermal equipment can and should be energy efficient, effective, safe and ecologically pure. This is achieved by the use of modern materials, the use of efficient heating systems, high degree of automation, structural adaptability. Czech company ТACHTECH s.r.o. is a modern scientific and industrial company develops and manufactures energy-saving thermal equipment with a wide range of applications. 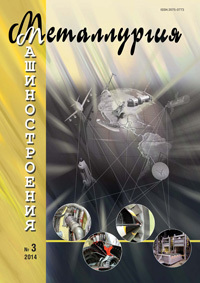 Larger share of activities of the company is production, reconstruction and recovery of thermal furnaces for various purposes, heating of stamps directly in presses, foundry ladle drying and heating, drying furnaces, burners to heat the edges before welding and other equipment for the metallurgical, foundry and blacksmith. The results of researches, exposing character of influence of construction of the gating system on the hydrodynamic speed modes features of the filling, distributing of metal streams and thermal mode of the form in the process of filling and after its completion, are resulted. It is set with the use of method of computer design that the increase of speed of the filling lays on certain limits on the use of the generally accepted constructions of the gating systems. Most it follows the full satisfying requirements of the speed modes of fill-out to count the method of admission of metal in a form through the siphon gating system. Key words:Direct and return riser, bottom feed of metal, large castings, hydrodynamics. The article discusses an “UTsR-6”unit designed to make metal powders (granules) of high-temperature and Ti alloys by centrifugal spraying of stock in inert gas atmosphere. In designing the “UTsR-6” unit they took into account many years of operation of similar equipment, implemented a number of new design solutions allowing to substantially expand the technological possibilities. Key words:Granule metallurgy, manufacturing equipment, centrifugal plasma spraying method, granule analysis. In this paper we consider thermal, aerodynamic and materials science aspects of the new process of directional solidification with a jet of gas-cooled molds for large gas turbine blades. The necessary conditions and parameters for implementing a new gas jet mold cooling process have been analyzed. Advantages of the new process of gas cooling of molds over the existing processes of Bridgeman vacuum cooling and liquid-metal cooling in aluminum melt for casting large turbine blades have been shown. Key words:Directional crystallization, parameters of gas jet mold cooling, argon as a coolant, casting large gas-turbine blades.